Our focus is you! From the moment you call our office to the last dance of your affair. 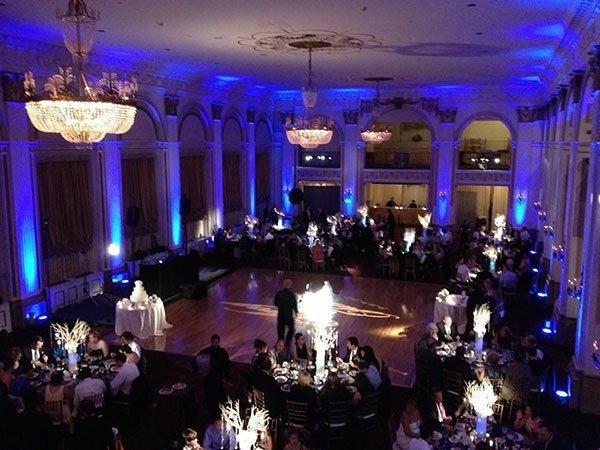 Our talented DJs and professional approach have brought us acclaim throughout Philadelphia and beyond! Browse our recent events below. We know you'll be impressed! Remember, we're here to answer any questions you may have. After all, your vision for your wedding or special event is unique, we're here to make your vision a reality! Whether you're looking for an outstanding Disc Jockey, Emcee, Up Lighting, even Photo booths, we've got you covered. Add a Photo booth and enhance any event by allowing your guests to take home a photo-keepsake they'll treasure for a lifetime! Untouchables Entertainment Group has the experience and the charisma to meet and exceed your expectations. Untouchables Entertainment Group also provides Karaoke and Game Show Mania! Treat your guests to something different with our huge Karaoke library, professional sound system, and professional monitors. Play Game Show Mania and show off your skills! We're not only entertainment professionals, we're here to help you with every aspect of your special event planning needs. Cool to the Touch LEDs! We're here to help! Have a question or want to check availability for your upcoming wedding or special event? We have the know-how to get you and your guests up on their feet and on the dance floor, throughout your entire event! Every Bride and Groom to-be wants to know their wedding reception and/or ceremony will be successful. After all, the one thing most people remember from a wedding was how great, or how lousy, the DJ was! Untouchables Entertainment Group has the experience, professionalism and expertise to ensure your wedding will be an event all will remember for the rest of their lives. Untouchables Entertainment Group is the best in the biz, simply put. Let us prove it to you! 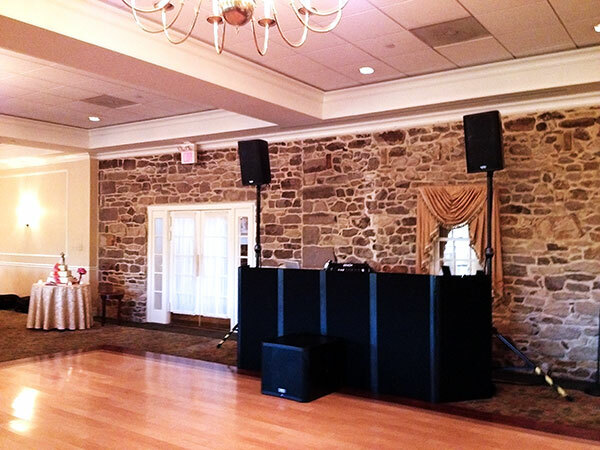 We currently provide exceptional Wedding DJ and Lighting Services in Philadelphia and all suburbs including Montgomery and Bucks County. All of our DJs will emcee your event. We will speak in a professional manner, emcee your introductions with energy! We run top of the line wireless microphones at all of our events for any speeches, toast etc. We have the experience and expertise to read the crowd and keep the energy going, without interruption. All of our systems have the best loudspeaker systems. We run self powered units and subwoofers, giving your event the superior sound it deserves! We make sure the volume is appropriate for the venue, and amount of guest at your event. Lighting can make all the difference! We run the best lighting available. We have special effect lighting to create that party atmosphere on your dance floor. 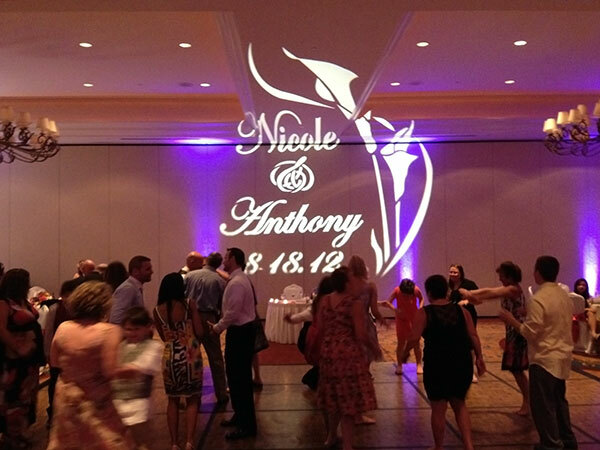 We have the best monogram (gobo) projectors, to ensure a super crisp image. We run all L.E.D. uplighting (Wall Washing) for bright vibrant color, and are SAFE - cool to the touch. Pin Spotting of your centerpieces, design lighting. We own all of our lighting in house. We do NOT sub out any of our services. Just a little education on uplighting here. We all know incandescent and halogen lighting get very hot. A lot of companies are running a par can fixture with a bulb in it for uplighting, using a colored gel to create the color you desire. These units are cheap (around $20 a fixture to purchase). It is a danger if you will be having any children at your event, as these units will run at around 300 degrees. Also, color can not be changed during your event, as it is just a bulb with a gel over it. 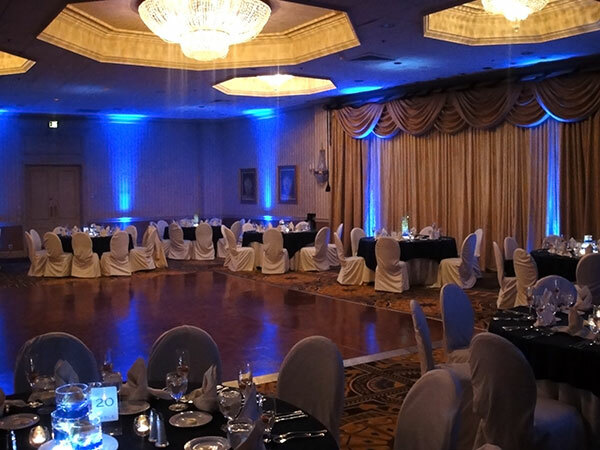 We run the best L.E.D units, which run at room temperature, can be programmed to change color during your event, even change to the beat of the music! Our units are wireless, and can even be battery powered if necessary. With our units, your color will be so vibrant, and your choices are unlimited! The color will carry up to a 100' ceiling or pillar, and look incredible. we will be glad to give you a demonstration when you come in to meet us. "... Thank you so much for being amazing. We'll recommend you to anyone looking for a great DJ!" It was clear we were on the right track as our clients did nothing but rave over our work. I always wanted to keep the focus on one thing, providing excellent entertainment. 20 years later we are still doing just that, and we are able to do so by keeping a small staff or experienced entertainers that provide personalized service for each and ever client. Contact us for a complimentary event consultation! We're happy to answer any and all questions. Get answers to all your questions easily right here on our page! When/How soon will my DJ arrive before my event? We arrive at least one hour prior to the start of your event. We arrive dressed appropriately in black/tux slacks, and a company polo or staff shirt. We will arrive even sooner if you have any extras, such as uplighting, monogram, photo booth, etc. Does Untouchables Entertainment Group have the required insurance that my venue requires? Yes we do. Most, if not all reputable venues require a 1 million dollar liability policy which will name them as the protected/certificate holder. We carry a 2 million dollar policy at no additional fee to you. If you hire a DJ that does not carry a policy, you may be required to purchase a vendor insurance policy, which can cost $250-$500 for a daily rate. Consider this when looking at cost of your vendors. Do you carry a back up system? Yes we do. 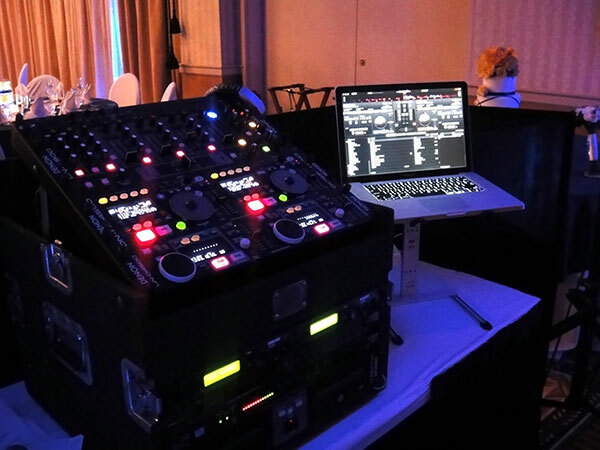 We are one of the only DJ companies that carries a complete back up system, and also for added peace of mind, we carry the extra expense of having a 24/7 answering service that notifies us via text, or phone call so we can have an immediate response with our staff. How long in advance should I book my DJ/Entertainment? We usually book our events from 6-24 months in advance. You don't want to wait until your event gets too close, and be forced to use a less than professional DJ, who are only available because they are not desirable. Can you provide a DJ/Lighting for my event if it is outside/on a beach/in a tent/at our home? Yes we can! We also have our own tents, generators, tables etc. We are here to make your vision a reality! We do not require much space, an 8 foot by 6 foot space, and a 6 foot table. Yes. unless specified by you that you do not want us to. If we feel the song is not appropriate, we will ask you before playing it. Will you use a banner to display your company name? Will my DJ coordinate with my Maitre'd/Event Planner before my event? Yes we do, we will work with ALL of your vendors, photographer, videographer etc. We make sure all of formalities go smoothly, line up your bridal party for introductions, prepare parents for dances, etc. We will make sure everyone is ready for these special parts of your event. Will my DJ contact me before my event to go over our details? Yes, we will be in touch and get all of your details the week prior to your event. We feel its best to go over all these details the week of your event. Its close to your event all of your details are up to date and fresh. Yes we can. We are recommended at many of the areas best venues and country clubs. If you would like personal references, we can provide them also. Will you take any breaks and do I need to provide a meal for my DJ? No! We provide continuous music throughout your entire event. It is NOT necessary to provide a meal for your DJ, if you would like to provide one it is appreciated. We do NOT leave the ballroom during the dinner service. We stay with our equipment the entire event. We are there to please you and your guest. Can we provide a list of music for you to play/not play? Yes you can. This is the information we will go over the week of your event, playlist, introduction list, do not playlist, specialty dances, etc. Will my DJ have a wide variety of music for request? Yes we do! We have over 100,000 titles in our library of CDs and MP3 files in our laptop systems. We carry top of the line laptops, and CD player units to ensure we will have everything you request. Also all of our DJs will beat mix all of your dance music. There will be no dead air between songs. We keep you and your guest up dancing! "We all had an amazing time at our wedding reception and we thank you for making it all happen. Thank you, from the bottom of our hearts..."
John and I wanted to write and let you know how thrilled we were with your work on our wedding day and in the months before! Everything went according to schedule, and when it did not, you were able to roll with the changes so well and accommodate our guests to be sure everyone was having fun. Those are the signs of a great DJ, we think, and for this we thank you. Our guests are still calling and telling us how much fun they had at the wedding, and so we owe many thanks to you for running the show! From the moment we frost talked, your professionalism and thorough follow-up struck me, and I knew we were in good hands. We know the music choices and the crowd were a bit nontraditional, but you rocked it! Thank you, again, for making our wedding so special. We wanted to send you a thank you for everything you did for us on our wedding day! It is definitely a day to remember forever and we're glad that you were able to share that with us. You were really able to keep the night flowing smoothly and you always played the right song at the right time! Your talent, great attitude, and professionalism is greatly appreciated! You're the best! Untouchables Entertainment Group is here to help with all your event planning, lighting, and entertainment needs for your wedding, bar/bat mitzvah, school dance or private party. 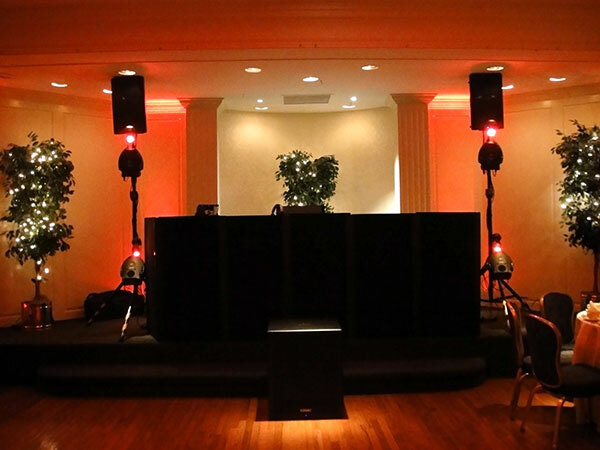 We currently provide exceptional Disc Jockeys, Emcees and special effects lighting and uplighting in Philadelphia, Montgomery and Bucks County, and all suburbs. Please use the below form to contact us directly! Unlike many, we're here to answer your questions - no matter what. Your wedding or special event is a personal affair and requires the utmost in attention. What sets Untouchables Entertainment Group apart, is our attention to detail and absolute devotion to each and every client. Reach out to us via telephone or email. We are looking forward to hearing from you!